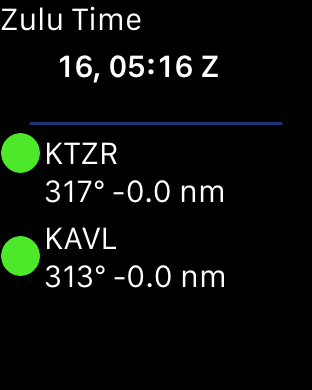 UTC time and departure, destination and alternate distance, bearing and weather (traffic light report) at a glance. 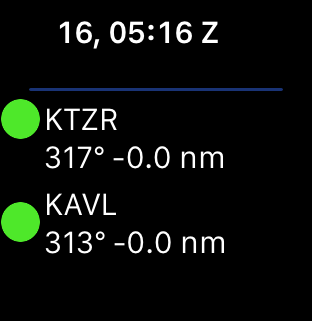 The sophisticated notification engine in AvPlan EFB has also been extended to the Apple Watch. You will receive runway warnings (as you approach and enter a runway), airspace notifications and frequency changes when enroute. In addition we have brought plain-text weather to the watch! Tap on an airport and see the current weather conditions. All decoded for easy reference. Expect to see AvPlan EFB for Apple Watch in around 10 days – it is a free upgrade for all AvPlan EFB subscribers.